My husband and I have been reading to our children since the womb. 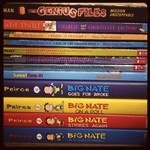 We would crawl into bed and choose from a stack of rhyming books to read my rounded tummy. When my husband read he could usually illicit movement as a response, a kick or punch. Sometimes there would be a somersault or full body stretch. One of the things I loved most about pregnancy. Our oldest son, at birth would try to turn toward my husband’s voice because he knew it so well. It was amazing to see a swaddled baby turn his head in the direction of his Daddy’s voice. 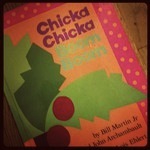 We received a copy of Chicka Chicka Boom Boom as a baby shower gift. A sing song story about the alphabet which I still have memorized to this day. Its bright colored pages took us from womb to tummy time. We would prop it up in front of him while he lay on his tummy. I would read it to him while he played in his bouncy seat. As a toddler the book went with him everywhere as a constant companion; it was always under his arm. He carried it to and from the sitters. We eventually had to buy a copy to keep at her place. He carried it to Grandma’s house. He held on his lap during car rides. We had to read it every night at bedtime. This is how he learned his alphabet. We had to buy our youngest son his own copy to destroy. And since we’d changed sitters we had to buy a new copy for her daycare library. So we’ve paid retail for this book at least 6 times, I’ve lost count. Crazy? No. Reading to our boys is a joy, not just for them but for us as well. They still find comfort in hearing the sound of our voices as we experience new or favorite stories together. It’s humbling really. It’s not just reading the words but finding ways to make the words come alive for them. 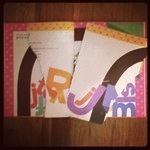 Chicka Chicka Boom Boom is more fun if it’s read (or recited in my case) with drama. Reading out loud is like performance art (think Russell Simmons Presents Def Poetry Jam). Reading is NOT boring and I want my boys to understand that. When my oldest says, “I can see it playing like a movie in my head,” I know we’ve done our best by the author’s words. Transitioning from rhyming books to picture books and now chapter books has been a wonderful journey. Watching my oldest read to my youngest fills me with a sense of pride and peace. I love it when they laugh at the funny parts. I am thankful when they are empathetic to characters’ embarrassments, disappointments, and triumphs. Their comprehension is evident when I hear them tell the storyline to others. We are reading, The Genius Files: Mission Unstoppable, which I feel is too mature for them. But it just means we can have conversation to unlock the mystery of what they don’t know. No matter what … my boys understand that words have power. And they love a good story. They know good stories are meant to be shared through voices of love. What about you? … What are the books from your childhood that fell apart because you read them so much? Is there a book that you always have a copy of on your bookshelf? Our family has a book that we have loved so much in the past that we just paid a goodly sum of money to ensure we have a copy of it–now that it is out of print. However, for generations to come, all the little people in our lives will understand that meaning behind the phrase “tasty baby belly buttons”! Too cute. You’ll have to show me the book next time I’m over there. I loved Chika Chika Boom Boom as a kid! My mom read me a book every night when I was little — my dad credits my early ability to read to her dedication. Apparently I was able to recite some books before I could even read them… And I’d have to say my all-time favorite children’s book is Shel Silverstein’s The Giving Tree. Thanks for the wonderful read! Thanks for reading. My son was the same way … reciting books before he could read them. If I missed a word he would tell me “That’s not what it says.” I loved the Giving Tree too. Thank you for reading Judy! I loved you post, thank you for sharing! Thanks Shantelle! Can’t wait to read what’s next on Candid Concourse.